The sunrise burns into existence, rising from the East with orange-pink flames as if the sun is mad at the night. A line of clouds hang above, catching the morning light as night retreats along the western horizon. I watch the battle from a cliff above the sea. The show will not last long. Most will miss it. The colors have already begun to fade into day. Below, a fisherman makes his way along the rocks toward the sea, a rod over one shoulder, a hopeful bucket in his hand. Waves crash against the shattered shore around him, turning the blue-black sea into sprays of white foam. In the distance, the sun reaches the horizon, glowing like an ember. The last stars flee for the other side of the Earth where the eternal battle has shifted in their favor. I watch for a moment longer then run to pack my bag. The night is lost and the day has begun. The sun will come for me next and I have miles to walk. Posted in Europe North to SouthTagged ENS, Europe North to South, featured, Portugal, Rota VicentinaBookmark the permalink. Beautiful images,Daniel. 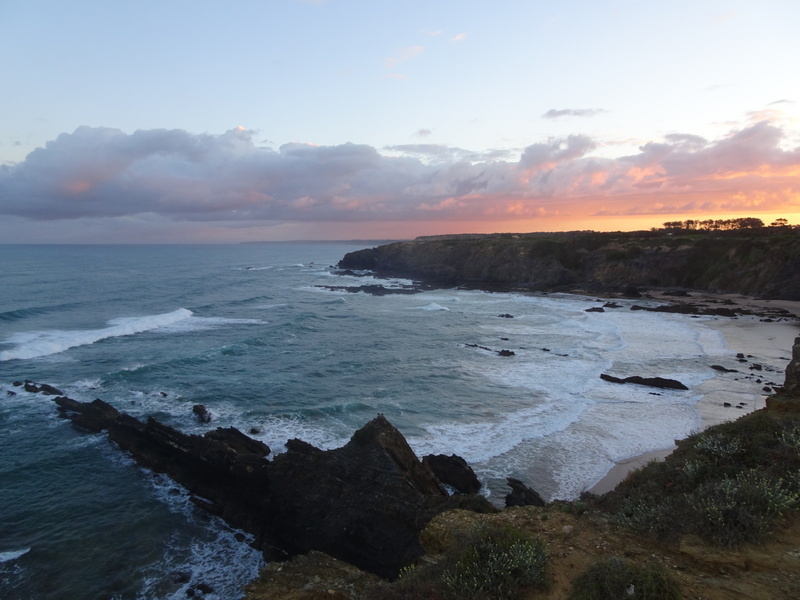 I am so glad that you have been having this experience of the beautiful coast of Portugal. Thank you for sharing it with us so vividly. Yes. Most of us miss way too many sunrises and sunsets. These daily transitions are a remarkable gift from the universe that nurture our soul. Thanks for witnessing and sharing the beauty and uniqueness of this event. Namaste.